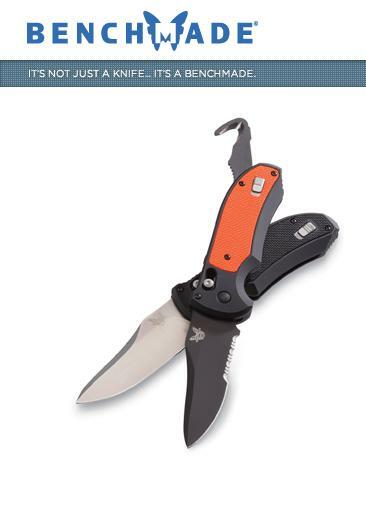 The overall winner of Kokatat’s second-annual American Made Outdoor Gear Award is Benchmade Knife Company. Open to all American manufacturers with a compelling story, the award was conceptualized and hosted by Kokotat Inc., the leading US manufacturer of technical apparel and gear for paddle sports. Benchmade has been producing premium knives and tools in its Oregon City, OR, facility since 1988. In a market dominated by imported products, Benchmade has used their domestic manufacturing as a point of differentiation, and has built a reputation for innovation and customer service. As winners of the American Made Outdoor Gear Award Benchmade will take one-year ownership of the “Sassy” travelling trophy — a hand carved, 3-foot-tall, redwood Sasquatch from Humboldt County, CA. An official “Sassy” presentation will be made on Wednesday, January 22, 2014, at the Outdoor Retailer Winter Market in Salt Lake City, UT. Over 85 domestic manufacturers in the outdoor market entered the second-annual “Sassy” award program – a chance to raise a glass to the leaders in American made quality, craftsmanship and creativity in the outdoor world. Kokatat’s hosting of the awards is rooted in its own history, as the brand’s founder and president, Steve O’Meara, recognized from the start that keeping production local was necessary in order to control quality and continually develop the finest and driest paddling apparel in the world. The data also revealed geographical insights. Over half of the applicants representing 29 states hailed from six states: California, Colorado, Maine, North Carolina, Oregon, and Washington. Traditional manufacturing states like Maine, North Carolina, and Pennsylvania were well represented. A pocket of domestic manufacturing is growing in the Rocky Mountains with Colorado, Idaho, Montana, Utah, and Wyoming accounting for 25% of applicants. In addition to the overall winner, Kokatat recognized winners in several categories based on company size. The category winners will receive a miniature version of the Sassy award during the Outdoor Retailer Winter Market celebration. o Winner: Lincoln Canoe & Kayak of Freeport, ME, manufacturer of canoes and kayaks. o Runner up: Voormi of Pagosa Springs, CO, producer of technical wool garments. -Winner: RAMP Sports of Park City, UT, a ski and snowboard manufacturer. -Runner up: Dahlgren Footwear of West Linn, OR, makers of performance socks. o Winner: Sterling Rope Company of Biddeford, ME, a safety rope, cord, and hardware manufacturer. o Runner up: Diamond Brand of Fletcher, NC, manufacturer of shelters, covers, and bags. o Winner:Polartec of Lawrence, MA, producer of performance textiles. o Runner up:C. C. Filson Co. of Seattle, WA, makers of rugged luggage, apparel, footwear, accessories and headwear. For additional information about the 2014 American Made Outdoor Gear Award visit www.kokatat.com/sassy.